American Indians in Children's Literature (AICL): Did JK Rowling Change the Images on her Magic In North America Series at the Pottermore Site? 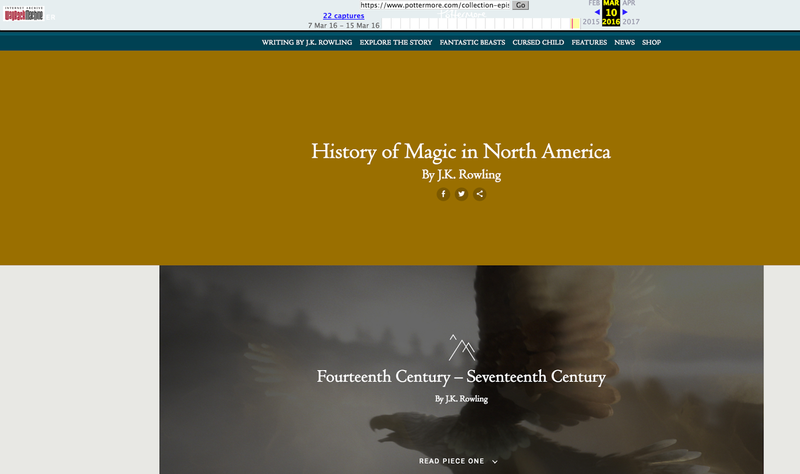 Did JK Rowling Change the Images on her Magic In North America Series at the Pottermore Site? If you're following the response of Native people to JK Rowling for her "History of Magic in North America" stories that are short backgrounds for the next movie, Fantastic Beasts and Where to Find Them, I think you'll be interested in this bit of info. Last Thursday (March 10, 2016) I began compiling a list of blog posts and threaded tweets by Native people who were responding to JK Rowling's "History of Magic in North America" series. I included a screen cap from the Pottermore site that had a flying eagle as the image for the story. 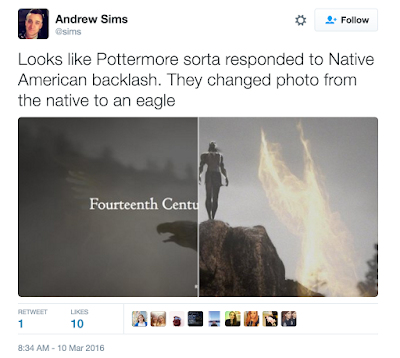 Seeing that eagle struck me as odd, because the day of my first tweet (March 8, 2016) I had seen a different image on the Pottermore site--the one of an Indian standing on a cliff. Using the Internet WayBack Machine, I figured out that the image changed sometime between March 9 at 8:10:58 PM and March 10 at 5:17:17 AM. As far as I know, JK Rowling has not responded to any of the criticisms Native people began putting forth on March 8th. Someone did make a change to the site. I suspect it was Rowling. Will we hear more from her? Because she has tweeted in support of various marginalized groups before, her lack of response to us is troubling. As they say on TV "stay tuned" to AICL for updates. So, just a heads up: the Ilvermorny School of Witchcraft and Wizardry - the North American wizarding school - is now "coming soon" on Pottermore.